The tree you choose to plant should depend to some extent on the constraints of the space you have for planting – and vice versa. Like any plant, different species of trees have different growth requirements, and you will need to find out if the tree you want to plant will match the quality of soil you want to plant it in. Also, the level of shade available to the tree is important to consider—some trees like a high light environment, whereas others do best when shaded. To learn more about trees that are appropriate for our region, and their basic requirements, check out the Province of Ontario’s Tree Atlas. Some trees are well adapted to living in urban environments like the Ottawa area. The Ecology in the Glebe report details the moisture, soil, and shade preferences of a wide range of local trees, and is another great place to start your research. 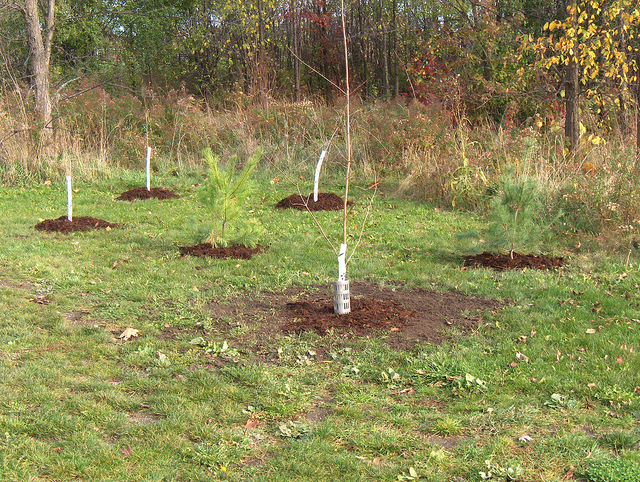 Always plant trees native to our region, to prevent spreading invasive species or diseases that damage our ecosystem. The biology and life cycle of the tree is also important to consider, depending on your reasons for planting it. Are you hoping to someday get fruit from your tree? Then it’s important to find out if the fruit tree you’re considering is self-pollinating, or cross-pollinating. Self-pollinators will give fruit without the need of pollen from another tree, whereas cross-pollinators will not bear fruit unless another tree of the same type is close by (this is so that wind or pollinators such as bees and butterflies can transfer pollen between the trees). When you set out to purchase the tree of your choosing, make sure it is healthy. You can do this by checking if the tree’s measurements meets nursery standards. Once you’ve brought your chosen tree home to plant, keep it healthy. Trees in containers (usually young, small saplings) should be watered regularly before planting. Trees where the root ball is covered in burlap (usually older, large-caliper trees) should be planted as soon as possible after purchase. When choosing between a small sapling and large-caliper tree, it is important to remember that saplings generally do well once planted, as they are young and able to withstand the shock of being planted in a new environment. Large-caliper trees are often several years old, and are used to a specific environment. They take much more time to adjust to new conditions, and are more likely to suffer from transplant shock. Wait! Don’t start digging just yet! Here are a few things to consider before you dig. Whose land is it? Is there a network of gas lines, water pipes, telephone and hydro cables? Is there a septic system? Keep in mind the size of the tree once it is full grown, and how that may impact local features. Before you dig, contact Ontario One Call, by phone at 1-800-400-2255 or online at on1call.com. This free provincial service will provide you with information about any underground services (pipelines, cables, etc.) that could affect where you plan to dig. It is mandatory by law to call them at least five days before starting to dig a hole. If you want to plant a tree in a park or public place, call the City of Ottawa. The city is committed to planting more trees and is open to citizen input on where to put them. If you’d like to have a tree planted on city property in front of your home, and are willing to care for it once it has been planted by the city, check out Ottawa’s Trees in Trust program. Once you’ve decided on a tree and have selected an appropriate site, find the best season to plant it in. 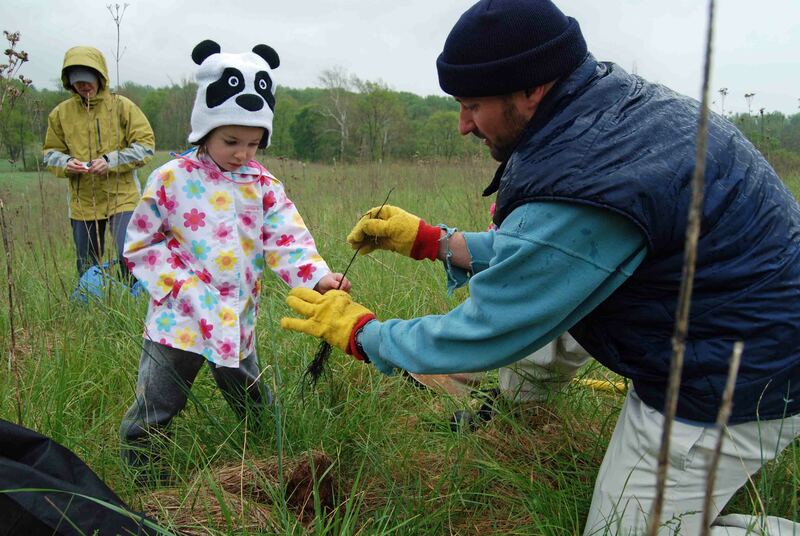 In general, early spring and autumn are the best times to plant a tree. Now that you’ve found a suitable site, and selected your tree, let’s talk about how to plant it!